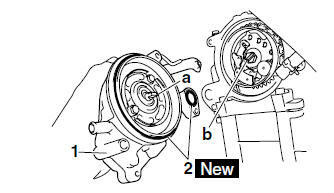 Align the projection "a" on the impeller shaft with the slit "b" on the camshaft sprocket bolt. Lubricate the O-rings with a thin coat of lithiumsoap- based grease. Refer to "CHANGING THE COOLANT" on page 3-15.